CIDCO Approved ‘YASHWANT – VIVA Township’ is a intelligently designed structure standing 7 Storey tall comprising of shops, Exclusive Personal Terrace flats on first floor and five floors of modern and spacious homes. ‘YASHWANT – VIVA Township’ is well planned vast township with special features like Health Club, Restaurant, Landscape Gardens, Play Ground, Children Play Area & ‘D’ Mart, Shopping Mall, Multiplex, School & Viva College. Complex becomes a self-contained abode of happiness and satisfaction. Joint Free Vitrified 24” x 24” Tiles Flooring for Entire Flat. Fine Finish Black Granite in Kitchen Platform with Trolleys & Stainless Steel Sink. Loft Tank for Each Flat. Wooden & Marbel Frame for Door & Windows. Powder Coated Aluminum Sliding Windows Fully Glazed with Tinted 4 MM Glass with Mosquito Net. Decorative Curtains in Living Room & Bedroom. Concealed I Electrical Fittings Using Copper Wiring with Quality Fixtures. Lift of Reputed company with Decorative Entrance and Inverter Backup. Provision for Tube Lights & Ceiling Fans. Provision for Telephone Connection in Living Room & Bedroom. Provision for CABLE TV Connection in Living. 1 BHK - 535 & 540 sq.fts. 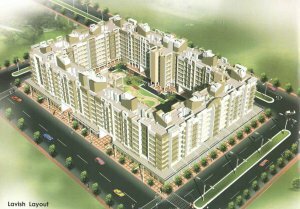 2 BHK - 815 sq.fts.